I got an email sent at 9:36pm Wednesday by Virginia Delegate Patrick Hope (D-Arlington) asking me to sign a Change.org petition asking for universal background checks in the Commonwealth of Virginia. Not only does this come less than 15 hours after a TV reporter and cameraman were murdered in Virginia but it explicitly ties the appeal to that. The crime scene is still fresh and this blood dancer is reveling in it. Because the killer doesn't fit the usual constructs, instead of blaming the person or even a broken mental health system, Del. Hope blames the gun. That is, the totally inanimate object that the killer appears to have purchased at retail after a FBI background check. While neither the killer nor the method in which he purchased the gun fits the narrative, this doesn't stop Del. Hope from conflating this tragedy into a call for universal background checks. Mr. Hope seems to be a person willing to abandon principles for political gain. According to his biography, he grew up in San Antonio, Texas, attended a Baptist high school, attended Catholic-run St. Mary's University in San Antonio, and then moved to the DC area seeking fame and fortune. Along the way, he picked up a Masters and law degree from Catholic University while working on Capitol Hill. In the latest news from his website, he is proudly proclaiming he was given a major award from the National Abortion Rights Action League (NARAL). Pardon me if I am suffering from a little bit of cognitive dissonance. Less surprising is that he is also an Adjunct Professor at Johns Hopkins' Bloomberg School of Public Health where much of the so-called scientific gun control research originates. Rather than blaming the object used, I humbly suggest that Del. Hope look at both the role that the media played in setting this man off and the broken mental health system. Either one or both of these are more at fault here than the inanimate object that seems to have been legally purchased. You probably woke up this morning and saw the news just like I did: another terrible shooting occurred – this time in my home state of Virginia. From Newtown to Aurora to Charleston and now Moneta, Virginia, horrific acts of gun violence are becoming the norm in local communities across the nation. We lost Alison Parker and Adam Ward today – two young journalists who were gunned down on live television. Their heartbreaking story mirrors so many others nationwide, where people who've been going about their lives – attending church, going to school, watching a movie, or just doing their jobs – have lost their lives to senseless acts of gun violence. The time for change in my state is now. That’s why I started a petition on Change.org to call for comprehensive background checks for all gun purchases in Virginia. Will you please sign it? As a Virginia State Delegate, I’ve supported common sense gun safety measures like background checks in the legislature – only to see them stall because of political gridlock, undue influence from the gun lobby, or just sheer apathy. We’ve seen tragedy in our backyards before with shootings like in Virginia Tech, and now again today in Moneta, but haven’t acted. We can’t let another one pass without collective action. Many people feel powerless in these situations because of the political climate that holds us back from real change. I’m asking my colleagues to put people first to get this done once and for all. I know we can’t end all acts of gun violence, but that doesn’t need to stop us from advancing common sense solutions like background checks that can help keep guns out of the hands of people who shouldn’t have them. Please, sign my petition, and let’s try to take a small but important step forward in addressing the epidemic of gun violence in our country. The chutzpah of the gun prohibitionists is certainly on display here. The Brady Campaign is highlighting an article from Mike Bloomberg's newest media property TheTrace.org. The article says the abortive terrorist attack on the Amsterdam to Paris train which was stopped by three young Americans, a British businessman, and an undisclosed Frenchman shows that you don't need guns. Evan DeFillipis and Devin Hughes say the fact that the people who stopped the attack were unarmed validates data from the latest research by Harvard's David Hemenway. Defillipis and Hughes, Oklahoma-based investment advisors who blog at Armedwithreason.com, go on to say that Hemenway's "research" shows that having a firearm does not make a person safer nor give you any advantage in protecting property. What they don't discuss is why these incidents always seem to happen in gun-free zones. I guess that would not support their narrative. As an aside and it has nothing to do with the article, how narcissistic do you have to be to put your SAT scores in your LinkedIn profile? There are some things you just can't make up. With Hillary Clinton mired in her email and other troubles, Rupert Murdoch is trying to start a "Draft Bloomberg" movement. Now enter a man who knows a thing or two of drumming up attention (and selling papers) - Rupert Murdoch. Just as massive stock drop has many investors eyeing the financial headlines, the media mogul is stirring the pot, trying to draft fellow billionaire businessman Michael Bloomberg into the presidential race. Yahoo News has the story in this video below. They discuss how Trump has upended things and perhaps set the stage for a Michael Bloomberg. The very thought of having, in Michael Bane's words, that nasty little fascist as the President of the United States is repugnant. It is not just what he would do to the Second Amendment that scares me but his entire "I know what's best for you" agenda. If you combine Bloomberg's authoritarian impulses with what Barack Obama has done to to the Executive Branch, I could see myself moving to a freer country. You know, like China or Russia. They couldn't be as bad as living in a country where Mike Bloomberg controlled the reins of government. If you are an investor in the stock market, the last few days including today have been a little unnerving. At one point this morning, the Dow Jones Industrial Average was down by 1,100 points. As I write this, the DJIA is down by over 450 points after recovering earlier to about 150 points down. I suggest a deep breath and a glass of bourbon or a libation of your choice is in order. To go along with that glass of bourbon is this trailer for a new documentary on bourbon entitled NEAT. The National Shooting Sports Foundation has released another of their training tips video. This one features Adam Painchaud of the Sig Sauer Academy. In the video, Adam demonstrates a slide lock reload drill. This drill consists of two precision shots at a 25 yard steel target, a slide lock reload while moving backwards and finishes off with two close range shots on a paper target while moving. Adam notes that the drill teaches self-discipline because it forces the shooter to concentrate on the second 25-yard shot before moving backwards and reloading. The natural tendency is to think about the reload and the move as you are taking that second shot. A group of 13 US Senators led by Sen. Richard Blumenthal (D-CT) and Sen. Chris Murphy (D-CT) are trying to pressure Cabelas and Bass Pro Shops to ignore the law regarding NICS checks. They want these retailers to transfer firearms if, and only if, the NICS check comes back from the FBI as "proceed". Under current law, if the FBI delays the NICS check, the FFL is allowed to transfer the firearm after three business days if they haven't received a denial. Those extra three days are for the FBI to investigate purchasers who may have had a hit in the databases. Usually these are false positives. If, the customer’s submission ends up in a “Delay” status, it means that the “Hit” produced a possible or valid match in one or more databases, and more research will be required to determine if any federal or state prohibitors apply. When a transaction is delayed and a final status decision cannot be rendered within the allotted three-business day time frame, and no other restrictions exist, the FFL is legally permitted to transfer the firearm at their discretion. The anti-gunners know more than they are telling, however. First, according to the FBI, if a background check cannot be completed within three days, “the NICS Section continues to search for the information necessary to make a final determination” and, if a person is determined to be prohibited, NICS will notify the BATFE to recover any firearms such person may have acquired. The FBI reports that in 2014, “The NICS Section forwarded 2,511 firearm retrieval referrals to the Bureau of Alcohol, Tobacco, Firearms and Explosives,” something on the order of about 0.1 percent of all firearms sold by dealers that year. Second, in some instances, even though the FBI continues working on an unresolved check after three days have passed, it will do so only for 90 days, after which time the check is terminated. Were dealers to acquiesce to anti-gunners’ new demand, people could be prevented from legally buying firearms by simply delaying their background checks until the time allotted for their checks expires. That would certainly “slow down” firearm sales, while gun control supporters continue working toward the registration portion of their long-standing three-part plan by requiring background checks on private firearm sales. My response to any retailer seriously considering changing their policies in order to appease the gun prohibitionists is a little three word reminder of the consequences. Smith. And. Wesson. For those unfamiliar with what I'm alluding to, Smith & Wesson under their former British corporate owners had signed a letter of understanding with then-Secretary of Housing and Urban Development Andrew Cuomo that voluntarily submitted to the company to government restrictions on sales and distributions among other things. 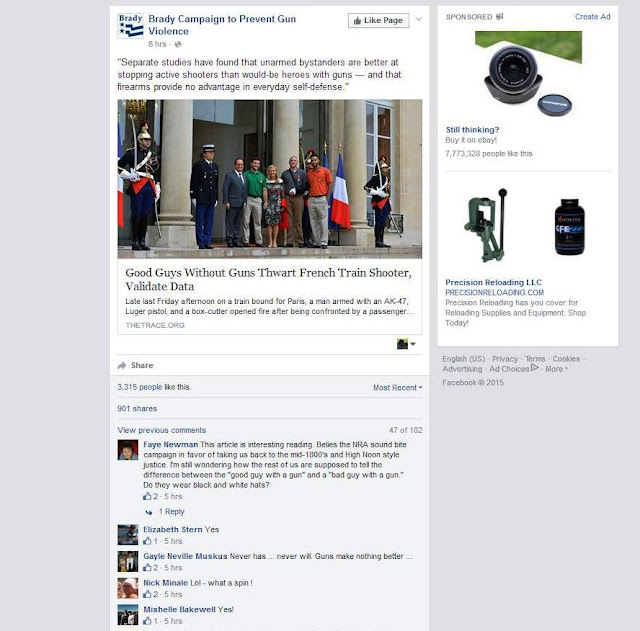 The reaction of the gun community was swift and severe. S&W almost went into bankruptcy and ended up being sold for a mere $45 million to new owners. These new owners quickly repudiated the agreement and the S&W as we know it today was created. Social media and the Internet were just getting started back during the Clinton Administration. The reaction nowadays to a company trying to appease the gun prohibitionists would be swifter and more comprehensive. Cabelas, Bass Pro Shops, Gander Mountain, Sportsmans Warehouse, and others should take that as a warning and a promise. Brownells is my go-to place to get firearm parts. They, along with a few others, usually have everything I need. Well, thanks to a post on The Firearm Blog, I may be revising my choice on where to get gun parts. I'm thinking it just might be Lowes. That's because they a good selection of staple guns. Staple guns and firearms? Huh? I would have said the same until I saw this video by Clint Westwood who used a staple gun as the basis for a 4-shot .410 shotgun. He calls it the Kaulkinator and has a photo log of the building process here. You can see the Kaulkinator or K-441 in action in the video below. If you think about it, this could be the Liberator pistol of our generation. I really like what Cody Wilson is doing with Defense Distributed but this is even easier and you don't need a 3-D printer. As to the legality of it, so long as the barrels are rifled, then it would be classified as a pistol just like the Taurus Judge. Otherwise, it would be a short-barreled shotgun and fall into the NFA realm. However, if the world goes to hell in a handbasket and we fall into a period of SHTF, TEOTWAWKI, or WOL, then who cares. For years, Aimpoint has been the go-to company if you wanted a small, rifle-mounted red dot scope with ultralong battery life. Now Trijicon is has released their MRO (Miniature Rifle Optic) which seems to be directly aimed at the Micro T-1 and Micro T-2. Trijicon is claiming a 5 year battery life. If you look at the picture above of the MRO, you can see that it is is cone-shaped and not tubular. Trijicon claims this makes for faster target acquisition and better situational awareness. The scope isn't cheap. The MSRP is $579 without the mount which costs in the $50-60 range depending upon height but it is still slightly cheaper than the Aimpoint product. That said, if it is like any Trijicon product, it will be well made and rugged. I don't see this new red dot as a game changer but I do see it as giving the customer more choices for small, ultra-rugged, military-grade red dot optics. If you prefer to buy American-made products, the MRO is made in the US while the Aimpoints are assembled in Sweden with some US parts. Travis Haley has a first look review of it in this video. Thanks to the District of Columbia City Council and their anti-gun policies the taxpayers of the District are having to shell out $75,000 in legal fees to the Second Amendment Foundation. This is a result of their having lost Palmer v. District of Columbia and the award of attorneys' fees to the plaintiffs. (Alan) Gura, of Gura & Possessky, represented the plaintiffs who challenged the ban. He asked the court to award $54,720 in fees and costs in August 2014, but he continued to rack up billable hours while the city contested Scullin’s ruling and the two sides fought over whether the city had complied with the judge’s decision. In June, the parties told Scullin that they were attempting to reach an agreement on fees. Notice of the settlement was filed with the court late Thursday. Gura declined to comment, as did a spokesman for the D.C. Office of the Attorney General. In the aftermath of Scullin’s decision in the firearms case, Palmer v. District of Columbia, the city adopted regulations for residents who wished to apply for a permit to carry concealed firearms. Gura is challenging those regulations in a pending case, Wrenn v. District of Columbia. While I feel for the taxpayers of DC, I take heart in the fact that there are many gun prohibitionists like Ladd Everitt of the Coalition to Stop Gun Violence (sic) who live in the District. You can read the agreement at the link to the Legal Times above. When I posted my plea for some help with The Polite Society Podcast's GoFundMe campaign on Monday, we were short of our goal by $275. Thanks to those who contributed as well as those who shared the post, we surpassed our goal by early Tuesday. The excess amount will be donated to the Second Amendment Foundation. From the bottom of my heart and on behalf of all of us at The Polite Society Podcast I'd like to thank all who helped make this effort possible. 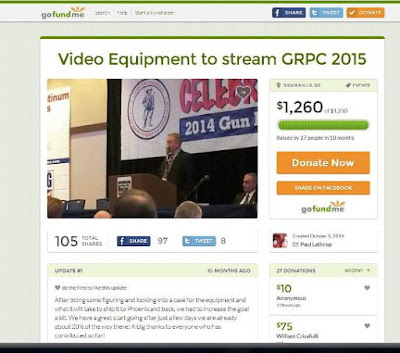 Stay tuned for more details on how you can watch the live stream from the 2015 GRPC that you made possible. The National Shooting Sports Foundation adjusted NICS checks for July 2015 were just released today. They show the highest numbers for a July on record. 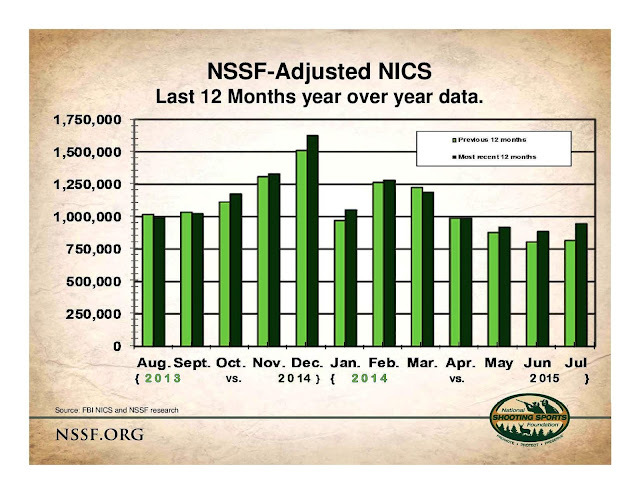 According to the release from the NSSF, there were 946,528 checks as adjusted. This was a 15.9% increase over July 2014. Going back to the July 2013 numbers which were the highest for July until now, the NSSF reported 855,259 checks as adjusted. Thus, July 2015 represented a 10.67% increase over the 2013 figure. While 2014 was a bit of mixed bag, it appears that 2015, for the most part, is starting to show increases over the prior year's statistics. 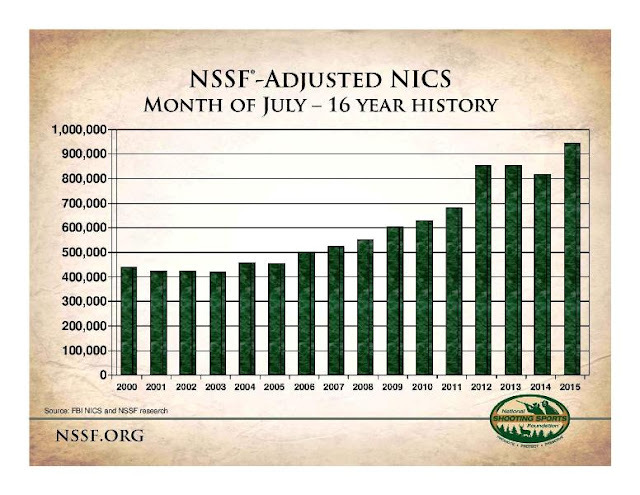 It is important to note that NICS checks are not a perfect correlation with gun sales. States such Iowa, Michigan, and Kentucky use the NICS system for background checks on both new and existing concealed carry permits. Moreover, in a number of states such as North Carolina, a concealed carry permit is accepted in lieu of running the NICS check. As many of you know, I'm also a co-host of The Polite Society Podcast. We have a project that needs your help. We, in conjunction with the New Jersey Second Amendment Society and Ammoland.com, are going to live stream the 2015 Gun Rights Policy Conference. This is the annual event held by the Second Amendment Foundation which brings together speakers from around the country to discuss all aspects related to the advancement of Second Amendment rights. The event is free to attend. However, you still have to get there. Last year, many people who would have attended couldn't get there because a suicidal FAA employee disrupted air traffic around the country by cutting cables in a major radar facility outside Chicago. I know I got caught in that mess and couldn't get to Chicago even after I drove to another airport. Then there is the cost of getting to the conference. If you live in Phoenix, then you don't have worry about it. In my case, I'm having to fly so have airfare and hotel expenses. By live streaming the conference, we are bringing the conference to you in the comfort of your home. For free. No suicidal FAA employees disrupting your travel plans. No TSA "pat-downs" to raise your blood pressure. As I said above, we need your help to bring it off. We have a budget of $1,250 to purchase the requisite equipment and cables. We have a GoFundMe page set up for donations. As of today, we have raised $975 of that total. That leaves another $275 that we need before the mid part of September. If 55 people were to donate $5 each or about half the cost of a movie ticket, we'd hit our goal. If 35 people were to donate $8 each or about the cost of a six-pack of craft beer, we'd beat our goal by $5. You get the idea. Again, the link to the GoFundMe page is here. Please donate what you can. Frankly, I'd rather see a lot of smaller donations than one or two big donations because that would more accurately reflect the grassroots that make up the gun rights movement. Grass Roots North Carolina is reporting that Gov. Pat McCrory (R-NC) has signed HB 562 into law as of August 5th. It is now part of the 2015-2016 Session Laws. While it obviously was a compromise bill, it does contain items that will advance gun rights here in North Carolina as GRNC details below. Now that this has become law, it is time to start thinking about the 2016-2017 session and what should be on our list to demand. The repeal of the pistol purchase permit system should be at the top of that list. Another thing I'd like to see is a uniform posting law similar to Texas' 30.06 law. I'm sure my North Carolina readers can come up with a list of their own. Governor Pat McCrory signed the GRNC-backed Omnibus Gun Legislation House Bill 562 into law yesterday. We want to thank Governor McCrory for signing this bill, as well as NC Representatives Jacqueline Shaffer (R-105); Justin Burr (R-67); George Cleveland (R-14); as well as Senator Jeff Tarte (R-41) for their efforts in getting this bill passed with the strongest language possible. Most of all, we'd like to thank you for your support of GRNC. 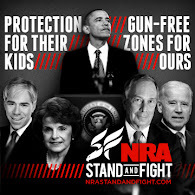 Without you, we cannot continue to our tireless work to defend your 2nd Amendment rights. Full text of the bill is available by clicking this link. I read two stories in the last 24 hours that reinforced why every state should have preemption on firearms issues. The gun prohibitionists oppose this saying, in essence, different laws for different locales lets us preserve our pockets of irresponsible gun control. What makes these two stories different is that they come from red states where gun ownership is more the norm than the exception. The first story comes from Nebraska where a judge last Friday ordered the return of a Lincoln man's gun collection. The only problem is that the city ordinances of Lincoln won't allow him to have them within the city. Under their city ordinances, a person convicted of a weapons charge (including knives) is forbidden to possess firearms within the city for the next 10 years. Police confiscated 24 handguns last August from Kevin Williams, who was accused of illegally possessing them after being convicted of having an illegal pocketknife, the Lincoln Journal Star reported. City Attorney Jeff Kirkpatrick said that during a 2010 traffic stop, Williams told a police officer that he had a butterfly knife. Police ticketed him for carrying a concealed weapon, because the knife was too long, and he ultimately paid a $75 fine. Police learned four years later that Williams had purchased many guns, and his conviction on the weapons charge for the pocketknife made him ineligible to possess a gun in Lincoln for 10 years. An officer then seized Williams' guns under a city ordinance on unlawful firearm possession. The knife in question was a butterfly knife. The city charged Williams with unlawful firearm possession. However, he fought it in court and the city requested the charge be dismissed. The Nebraska Firearm Owners Association says this illustrates the need for consistent regulations statewide and I would agree. The second story comes out of Idaho. In this story, an investigation of the Madison County Sheriffs' Department shows that they used concealed carry permit fees to buy firearms for the department and for new carpeting. This came just months after the county commissioners approved a request by Sheriff Roy Klinger to increase permit fees by 38% (an additional $20) back in 2013. The sheriff had argued for the increase saying they couldn't keep up with the demand. Records turned over to IdahoReporter.com revealed the agency has spent more than $60,000 on expenses not directly related to concealed weapons permit administration since 2011, including two carpet purchases and one outlay for tile in the office. Klingler characterized those expenses as necessary upkeep for his agency and said his office vetted the purchases through the county’s legal team. He also said critics focused only on larger purchases, but ignored how long his agency saved to be able to spend on the big-ticket items. Klinger said his critics have a "nefarious" agenda and are engaging in a "hate campaign against government/law enforcement". Interestingly, both the sheriff and his critics in the Idaho Second Amendment Association agree on permitless carry. While Pruett and Klingler agree on permitless carry, the ISAA president said Klingler needs to take action to ease the burden on Idaho’s gun owners. “The ISAA is here to protect Idaho gun owners and regardless of our agreement on permitless carry, we felt it necessary to bring this issue to light,” Pruett said with a nod towards Klinger’s advocacy for statewide permitless carry. What surprises me most about the Idaho story is that there isn't a uniform charge for a carry permit throughout the state. Both of these stories reinforce the need for statewide preemption on firearms matters just like the arrest of a tourist at Ground Zero in New York City illustrates the need for nationwide reciprocity on carry permits. Yesterday, I reported that Maj. Gen. Max Haston, the Adjutant General of the Tennessee National Guard, had authorized the carry of firearms by Guardsmen and Air Guardsmen while on duty. That, on the face of it, was and is a great leap forward in protecting the men and women of the Tennessee Guard from terrorists of all stripes. The carried weapon must "meet identical or nearly identical specifications of the M9 Beretta service pistol or smaller", and the local Commander gets to decide what that means. No revolvers or derringers. It must be carried in a holster that is "identical or nearly identical to the service-issued holster" worn on either the right or left hip. While not explicitly stated, it appears that open carry is not allowed. You may only have one. No carry in Government Vehicles or Storefront Recruiting Stations. This basically means that Recruiters--the ones being targeted--are effectively not allowed to carry. You may only carry in ACUs or Class A uniforms. Class A uniform carry is only allowed if you don't print and won't be required or expected to remove the jacket later. ACU carry is only allowed if blouse remove is not authorized. So if you're on kitchen duty, you're not allowed to carry even if you don't take off your blouse, because blouse removal is authorized in that scenario. Same thing if it's more than 85 degrees. You are carrying as authorized by the Handgun Carry Permit statutes. As such, you're not allowed to carry in schools or businesses that post 1359 signage. While not in the actual orders, the paper that the soldier is required to sign requires them to carry with no magazine in the weapon. I have confirmed with my source that this is, indeed, the intention of that language. Only allows carry on "authorized Military Department State properties", ie, not while in uniform (while out) in the general public. The key document is the Personally Owned Weapons Policy, ver. 4, which I have embedded below. In addition, here is the link to the document that must be signed and to the announcement sent to members of the Tennessee Military Department (NG and ANG). Maj. Gen. Max Haston, Tennessee's Adjutant General, gets it. He issued orders today that will allow members of the Tennessee National Guard and Air National Guard to carry while on duty at State armories and facilities if they have a valid Tennessee carry permit. He also announced the selected Guard personnel working at Federal facilities will draw and carry Federally issued firearms for protection. Finally, he has moved Army National Guard recruiters from storefront locations to local armories. Maj. Gen. Max Haston, Tennessee's Adjutant General, today announced that the Military Department has taken steps to increase the security of its personnel and facilities to include allowing Tennessee Army & Air National Guard members with valid Tennessee State Handgun Carry Permits to carry handguns at State Armories and facilities. Haston's decision follows Governor Bill Haslam's directive, issued earlier this month in the aftermath of the deadly shootings in Chattanooga, to review current Guard personnel who are authorized to be armed in the performance of their duties, and identify and arm Guardsmen where necessary to protect themselves, citizens and Guard facilities. "We have been very deliberate in making the decision to arm our Tennessee National Guard," said Haston. "This is not a step that we take lightly, but it is apparent that military personnel have been targeted and the protection of our Soldiers and Airmen is of utmost importance. Physical security and risk assessment is something that we continually do as part of our day to day obligations." I would hope to see this spread to more states. In the meantime, kudos to Gen. Haston for taking the necessary steps to protect the men and women under his command. Operation Fast and Furious and Project Gunwalker keep on giving. The latest is news that at least one of the Islamofascist terrorists who attacked Pam Geller's "draw Mohammed" event in Garland, Texas was armed with a pistol from one of the gun shops in question. Nadir Soofi purchased his 9mm handgun in 2010 from Lone Wolf Trading Company. This gun shop was cooperating with the BATFE in Operation Fast and Furious. Reports indicate that Soofi's purchase got slapped with a 7-day hold which was released 24 hours later for unknown reasons. Ginger Colbrun, chief spokeswoman for the federal Bureau of Alcohol, Tobacco, Firearms and Explosives, confirmed that Soofi legally purchased the 9 mm handgun from the Lone Wolf Trading Co. store in Glendale, Ariz., as reported by the Los Angeles Times over the weekend. But while the gun shop was the top outlet for the Justice Department’s secret Fast and Furious firearms operation at the time of Soofi’s purchase, the sale was not part of the sting and Soofi was not a known criminal suspect, she said. Previously, federal officials had refused to comment on the 2010 purchase.“There was no firearm associated with the Garland attack and Fast and Furious,” Colbrun said. We have heard many denials in the past that the operation even existed so I agree with Alan Gottlieb below that we need to investigate this further. While it may sound a bit like Alex Jones-like chem-trails conspiracy theorist lunacy, is it all that unreasonable to think that just maybe someone in the Justice Department not only was arming narcoterrorists but Islamofascists as well? This in an effort to build a case for draconian gun control within the United States. Hmmm. BELLEVUE, WA – The weekend revelation that one of the two would-be terrorist gunmen killed at a Garland, Texas attack earlier this year had purchased a handgun “through a botched federal firearm sting” is ample reason for Congress to re-open its probe of the Operation Fast and Furious scandal, the Citizens Committee for the Right to Keep and Bear Arms said today. The New York Daily News reported that slain would-be terrorist Nadir Soofi purchased a 9mm pistol in 2010 from the same gun shop that was heavily involved in the Fast and Furious gun trafficking case. At the time, the firearms retailer was cooperating with the Bureau of Alcohol, Tobacco, Firearms and Explosives in what was supposed to have been a gun trafficking “sting” effort. “But Fast & Furious was a fiasco,” CCRKBA Chairman Alan Gottlieb recalled. “The gun shop operator even expressed concerns about the way the investigation was being handled. Although the Garland gunman was not connected with Fast and Furious, because he was allowed to buy a handgun after a reported delay was placed on the transaction, we think Congress has good reason to ask more questions about the operation. “This new revelation shows that not only did the operation put guns into the hands of Mexican drug cartel gunmen,” he added, “it now appears that a future would-be terrorist was allowed to buy a handgun at the same time. “Nobody in the agency was ever held accountable for this blundering operation,” Gottlieb said. “One ATF agent even called Fast and Furious the ‘perfect storm of idiocy,’ and we’re inclined to agree. We predicted at the time that this operation would have far-reaching impacts, and that now appears to be the case. The Forbush Raptors and the Yadkin Patriots are this year's the senior and junior division champions respectively in the 30th annual International Youth Hunter Education Challenge. This annual event is held at the NRA Whittington Center in Raton, NM. These teams from the Piedmont section of North Carolina excelled at both marksmanship and non-shooting events such as orienteering and hunter safety. More on the events and the teams is in the release from the North Carolina Wildlife Resources Commission. The teams qualified for the national event through district and state-level competitions held by the Commission as part of their Hunter Safety Program. RALEIGH, N.C. (Aug. 5, 2015) — Youth teams affiliated with the N.C. Wildlife Resources Commission emerged as junior and senior division champions at the 30th annual International Youth Hunter Education Challenge (YHEC), a shooting and outdoors skills competition at the NRA Whittington Center in Raton, N.M. The National Rifle Association event was held July 26-31. Teams from across the country competed in marksmanship with .22-caliber rifles and black powder rifles at knock-down targets, shotgun on a sporting clays course, and archery at 3-D game targets. Non-shooting events included orienteering, wildlife identification, hunter responsibility exam, and a hunter safety trail test. The Forbush Raptors of Forbush High School won the senior division with a team roster consisting of Coach Chris Poplin and student competitors Colton Bullin, Jordan Dinkins, Dylan Horn, Dylan Poplin, Jordan Yale and Emry Wingler. The Yadkin Patriots of Forbush Middle School won the junior division with a team roster consisting of Coaches Carson Hobson and Brian Poindexter, and student competitors Colton Hanes, Matthew Lineberry, Clayton Medlin, Zack Norman and Garrett Poindexter. Both schools are in Yadkin County. Nearly 340 competitors, coaches and parents attended YHEC this year. Since its inception in 1985, YHEC has reached more than a million young men and women. See complete 2015 team results and individual standings here. In North Carolina, teams and individuals qualified for YHEC through the Wildlife Commission’s district and state Youth Hunter Education Tournaments, a component of the Hunter Education Program. Teams are organized on senior (high school) and junior (middle and elementary schools) divisional levels. For more information, go to www.ncwildlife.org/huntered. PolitiFact weighed in on the criticism of the Social Security Administration's proposal to report 4.2 million recipients to the NICS database as "mentally defective" because they have a named fiduciary to handle their money. They rated this "false" on their Truth-O-Meter saying, "Obama has not made a sweeping move to disarm gun-owning senior citizens, as these websites claim. We rate the claim False." The problem with letting interns handle something like this is that they often don't dig deep enough. The other problem is that there really isn't any accountability as the intern will be returning to school in a few weeks. A recent Politifact article attempted to fact check news reports about the Obama Administration’s effort to strip the gun rights of millions of Americans who receive social security and disability benefits who also have a representative payee – someone who handles their finances. Politifact failed to consult the most relevant source of all for their story, federal law, as a result, they got it wrong. · Social Security Administration recipients who have a representative payee have not been deemed “mentally incompetent.” That is not a legal term recognized in federal law as it relates to prohibitions against acquiring or possessing firearms. · Under the proposed new policy, individuals who have representative payees would lose the right to possess any guns they might currently own and would be prohibited from purchasing new firearms. · The term “adjudication,” refers to a determination made after a judicial-type process that includes various due process protections. In no case does the federal law describe or contemplate the type of prohibition by bureaucratic fiat exercised by the SSA in developing its guidelines for those with “representative payees” assigned to their accounts. · The SSA’s representative payee system is not the type of process envisioned by federal firearms statutes. · The Bureau of Alcohol, Tobacco, Firearms and Explosives has issued regulations that define an “adjudication” as a “determination by a court, board, commission, or other lawful authority that a person is, as a result of marked subnormal intelligence, or mental illness, incompetency, condition, or disease: (1) Is a danger to himself or to others; or (2) Lacks the mental capacity to contract or manage his own affairs.” This includes a finding of insanity or incompetency in a criminal case. · “Committed to a mental institution” is defined as a “formal commitment of a person to a mental institution by a court, board, or other lawful authority.” The definition makes clear that “[t]he term does not include a person in a mental institution for observation or a voluntary admission.” The Supreme Court has held that an involuntary commitment is a serious deprivation of liberty that requires due process of law under the Fifth Amendment to the U.S. Constitution. - individual may not be good at balancing their checkbook. There are a lot of state-level crimes for which you can also be prosecuted for at the Federal level. Under the "things I learned en route to looking up other things" category comes this 7/31/15 release from the BATFE which caught my eye for semi-obvious reasons. ASHEVILLE, N.C. – Anthony Lamont Hill, 31, of Fletcher, N.C., was sentenced today to 121 months in prison for his role in the 2013 armed robbery of a Dollar General store in Woodfin, N.C., announced Jill Westmoreland Rose, Acting U.S. Attorney for the Western District of North Carolina. Senior U.S. District Judge Graham Mullen also sentenced Hill to three years of supervised release and ordered him to pay $4,750 as restitution. Acting U.S. Attorney Rose is joined in making today’s announcement by Dewey “Craig” Chillcott, Acting Special Agent in Charge of the U.S. Bureau of Alcohol, Tobacco, Firearms and Explosives (ATF), Charlotte Field Division, and Chief Brett Holloman of the Woodfin Police Department. According to filed court documents and today’s sentencing hearing, in August 2013, Hill robbed at gunpoint a Dollar General store located in Woodfin. Court records show that Hill and his accomplice entered the store right before closing time. According to court records, Hill and his conspirator ordered two store employees to remove most of their clothing and proceeded to tie them up. Hill and his accomplice attempted to destroy the store’s security system, before fleeing with approximately $2,500 in cash they had taken from the store’s register, court records show. Hill pleaded guilty in December 2014 to one count of Hobbs Act robbery and one count of possessing and brandishing a firearm during and in relation to a crime of violence. Hill remains in federal custody and will be transferred to the custody of the Federal Bureau of Prisons upon designation of a federal facility. All federal sentences are served without the possibility of parole. The investigation was handled by ATF and the Woodfin Police Department. The prosecution for the government was handled by Assistant U.S. Attorney John D. Pritchard of the U.S. Attorney’s Office in Asheville. I had never heard of a "Hobbs Act robbery" before so I had to look it up. The Hobbs Act was enacted in 1946 to combat racketeering. Primarily aimed at labor-management disputes, it made the interference with commerce by "robbery or extortion" a Federal crime. In other words, the Hobbs Act was aimed at the Mafia infiltration of labor unions post-WWII. It is 18 US Code § 1951. Under North Carolina law (NCGS § 14-87), armed robbery is a Class D felony which under the current sentencing guidelines could be punished with up to 160 months imprisonment. However, the presumptive range which depends upon prior offenses and any aggravating factors would have been somewhere between 51 and 128 months of incarceration. Now I understand why the Woodfin Police Department referred this to Federal authorities for prosecution. They wanted Anthony Lamont Hill to serve some hard time without the possibility of parole for coming into their little town of 6,000 and robbing their Dollar General store. BATFE and the US Attorneys' Office probably saw this as a way to burnish their conviction statistics. I understand why Hill was prosecuted under Federal law but there remains the question of whether some local thug should have been prosecuted using a law obviously aimed at the Mafia. Given the torturous connection to interstate commerce (gun was made out of state as were most of the goods sold), philosophically I'm inclined to say armed robbery, other than of a FDIC-insured bank or post office, ought to be prosecuted under state law and by the local district attorney. That it can be prosecuted by the US Attorney goes to show just how broad the purview of the Federal government has become over the years. Unfortunately, I doubt we'll ever see a reversal of this trend. 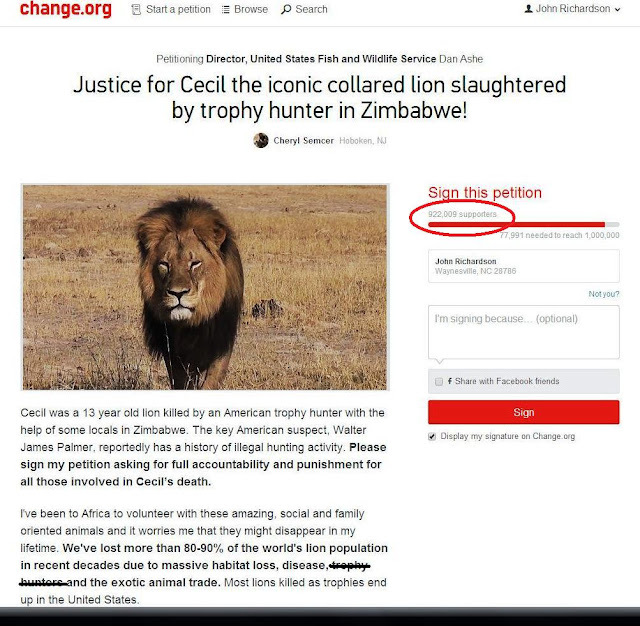 I got an email yesterday from Change.org asking me to sign a petition regarding "Cecil the Lion". The email said 846,000 people had signed the petition which asks for "justice for Cecil". As of a few minutes ago, that had risen to 922,009 signers. These people need to get a life. Trophy hunting, which Cheryl Semcer of Hoboken, NJ blames for the loss of a large part of the African lion population, is not the problem. Indeed, by putting an economic value on these animal, it has done more to preserve lions than anything a ban under the Endangered Species Act would ever do. It is the same with elephants and elephant ivory. Am I the only person out there who has found the name of the lion - Cecil - somewhat ironic? I would wager that most of the 922,009 people who have signed the petition never knew that Zimbabwe used to be known as Rhodesia. It was a country named for that famed British imperialist Cecil Rhodes. So we have a lion (the symbol of Great Britain) named for a British imperialist (Cecil Rhodes) by British scientists killed in the country formerly named for the imperialist (Rhodesia) that was forced by Britain to be handed over to Communist-backed insurgents who renamed it Zimbabwe.